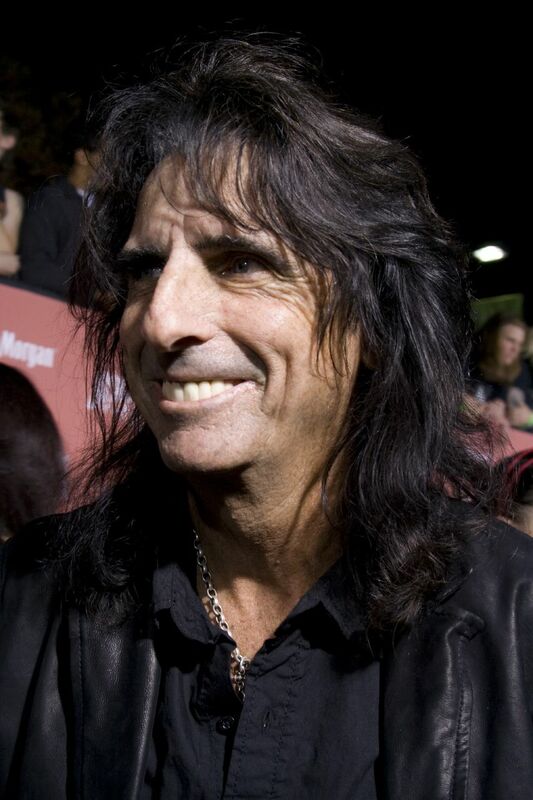 I remember watching a documentary on Alice Cooper, who described the time early in his career when he was discovered by legendary music producer Bob Ezrin. Alice credited Ezrin for teaching him how to sing, for teaching his drummer how to play the drums, teaching his guitarist how to play the guitar, showing Alice how to write songs, and basically guiding him on how to do everything a successful rock and roll act needed to do. I felt the same way when I recently homebrewed with my friend Eric, a much more experienced homebrewer, as we brewed up our Biscuits and Honey Amber Ale. Eric taught me about making a yeast starter, about sparging, using a wort chiller, and a bunch of other techniques that any good homebrewer ought to know, and I wrote about our collaborative beer for that last Beer Blogging Session. Maybe fifty years from now, will they etch on my tombstone the solemn words "He was best known as the Alice Cooper of homebrewing". A guy can dream, can't he? 1 lb of Organic Buckwheat Honey mixed with 6 cups of water, heated for 1 hour at 180F was added to the primary fermentor. 10 days later, transferred to a secondary fermenter for an additional two weeks. I should mention that one of us accidentally put two ounces of Galena hops into the boil instead of just one ounce. I won't mention any names, but his initials were Derrick Peterman. Thankfully, Eric didn't give me too much of a hard time after we discovered the error about five minutes into the boil. We fished out what probably amounted to a little less than an ounce of Galena hops over the next 30 minutes. I really liked the progression of flavors. It starts out with a sturdy, biscuit malt character, and then some of the honey notes kick in. There's also a hard to define light bitter note that has a tea-like character, and just a very slight sweetness from the honey. At the end, there's a strong, yet smooth hop bitterness. I'm no expert on these things, but I didn't pick up any off-notes or problems with the brew, unlike some of my earlier homebrewing efforts, and I'm really encouraged by our results. Next time we brew, I'm bringing some live bats. Sometimes out of the blue, life takes you places you never expected. One day in late April, my boss calls me into his office, shuts the door, and tells me our company is about to be acquired. Two weeks later, I'm meeting with the sales force and management of my new company in a small, isolated lodge 30 miles east of Logan, UT just south of the Idaho border. At 6,500 feet above sea level, a light snow fell steadily, even though it was early May. The only chance to run with all the planned activities was during the early mornings in snowy, windy 30 degree weather. I didn't pack any sweats or running tights, gloves, or a hat, but that didn't stop me from getting in a couple short morning runs. Running in just shorts and long sleeve T-shirt in these conditions creates a certain refreshing intimacy with the surrounding environment, as the cool air rushed by my legs and face, with the soft crunch and the strain of the changing terrain in each step. Running success is about overcoming barriers, so bad weather days give you the opportunity to train the mind to deal with discomfort and anything the weather might throw at you. Now I didn't run around in these conditions to the verge of frostbite, with the runs lasting only about 20 minutes. But now I'm better prepared for whatever cold and windy conditions the San Francisco Bay weather throw at me, and running around for 20 minutes is better than nothing. The Utah climate is not very kind to the craft brewing industry either. When a sizable fraction of the local population will not drink your product, or is even downright hostile towards it, a local brewery better brew something pretty good if they want to stay in business. But since 1986 Wasatch Pub and Brewery has survived, even thrived in such difficult business conditions. And since Wasatch founder and owner Greg Schirf spearheaded legislation in 1988 to make brew pubs legal in Utah, at least 12 brewpubs have followed Schirf's trail and found success is these less than ideal business conditions. I was fortunate to discover Wasatch Brewing's fine beers during my stay in Utah, which my new employers graciously provided. I'm quite relieved to discover my new bosses appreciate good beer. Especially since they checked up on me and discovered during a Google search that I write this blog. Here's a brief run down of the fine beers they shared with me. The Hefeweizen style is known for plenty of fruity, banana-like esters and light aromatic spiciness. I wasn't getting much of that here. This was more like a fizzy wheat beer with a light apricot tartness that harmonized well with the underlying wheat. The end result was pretty refreshing even if it didn't quite meet my intial expectations, and I appreciated the restraint of the apricot. This is actually brewed by Squatter's Brewpub, which partnered with Wasatch a few years ago. The light brew has a nice, earthy hop finish to it, and plenty of tingly carbonation. Another selection from Squatters, and if you like Cascade hops which I do, you're really going to like this one. Plenty of citrussy Cascade hop aroma and a bitterness, well balanced by a straightforward, bready malt. Not a very complex brew, as it was mostly a showcase of Cascade hops, and that works pretty well for me. Of course, as a red-blooded heterosexual male, polygamy suggests all sorts of intriguing carnal possibilities. But on further reflection, polygamy seems a bit overrated. Even if you really love the one you're with, would you really be happier with one, two, three or more of the same person around all the time? Now you know what I'm talking about. As for beer, I picked out plenty of rich coffee notes in all the roasted malt goodness. It's a very drinkable porter with the fizzy carbonation being the only slightly off note. Better to have a few extra beers than a few extra wives if you ask me. Moving to a new place is more than simply unpacking boxes and filling out change of address forms. It's also about exploring the new place, and that means finding new running routes. Sometimes when plotting a new route, I simply go out a general direction in hopes of creating one. This can lead to getting hopelessly lost or running around in circles, but eventually leads to a new place to run. It's often trial and error process, guided by experience, and a lot like learning, where frustration and confusion coupled with persistence eventually yields to discovery. Finding new places to run helps me put down new roots, which strengthen I periodically visit these spaces again and again. Setting up running routes in Belmont is made a lot easier by the great set of running trails they have in the open space areas around Water Dog Lake Park. It's something I've taken for granted living in the San Francisco Bay Area, where secluded trails are often just minutes away from highly urban areas. Having lived many placed both outside and within Bay Area, I can see myself putting down some good roots here in Belmont for a while. A number of big changes have happened over the past few weeks, and one of them is that I've moved up the San Francisco Peninsula to Belmont, CA, about 30 miles north of my old San Jose home. Since my kids live a majority of the time with their mom in nearby San Mateo, I realized I was missing too much of their lives down in San Jose. You can always go back and run races you've missed, or try beers you haven't gotten around to drinking, but there is a short of window of time you can be there for your kids as they grow up, and then it's gone for good. With all these big changes, I haven't gotten a lot of running in lately. But rest assured, I have maintained my usual beer intake. And yes, posts here have come fewer and further between lately, but that will be temporary. Next month, Linda and I will be taking the kids on a Southern California road trip, where we'll take the kids to some fun spots in Southern California, as well as some of the excellent brewpubs on the way. I think these will be some fun postings, and I've always said craft beer drinking and family peacefully mix and will take the chance to show it, rather than just talk about it. And this coming August, I'm hosting the Beer Blogging Session. The topic is "A Special Place, A Special Beer" and I'll be asking participants to explore the geographical connection to beer and places by writing about a special place in their lives and how the beer connects them to that place. Anyway, I'll start getting back into shape, and hope you'll stay tuned to the "new" Bay Area Beer Runner. For this month's Session, Mario Rubio of Hop Press asks us to write about beer collaborations. High school and college sports teach a lot about collaborations at an early age, where success or failure has few consequences compared to things like family or careers experienced later in life. In my senior year of high school, my cross-country team bickered and argued constantly. Virtually every team decision you can think of divided the team into angry factions. At the end of the season, when it was time to shut up and run the big races, we ran out of our heads and qualified for the high school state championships, despite not being one of the favorites to advance. And a week and several clashes later, we finished significantly higher at the state championships than we were ranked. Twenty-five years later, being part of this bickering, overachieving team remains one of my most successful collaborations. Four years later as a senior in college, our cross-country team was so chummy and got along so well no matter what, you'd think we were the College Glee Club instead of a bunch of fired up runners. And when it came time to qualify for the national championships, we ran such a flat and uninspired performance that the Glee Club probably would have beaten us. Passionate, strong willed people with distinctive talents create tension whenever they join forces. Shaped by my cross-country experiences, when I notice a distinct lack of tension in a group working together for a common goal, I start to get a little suspicious. Of course, conflict can lead to bad things, so how this tension is dealt with and resolved is often key to the success of any collaboration. And so when I started homebrewing with Eric, a long time friend of mine, I wasn't that concerned when I found we had rather different approaches of how to brew beer. Eric takes very meticulous notes and is very traditional in his methods and preferences, where I tend to rely more on intuition and experimentation. Eric is the far more experienced homebrewer, and his beers having won awards, but it had been eight years since he brewed his last beer, and he was looking to get back into homebrewing. Having made only four batches myself, I was a little intimidated working with someone with far more experience. Coming up with a recipe with Eric involved a few awkward moments. I was in the mood to make a light, clear, aromatic Amber Ale with honey. My first homebrew was an Amber Ale, and I enjoyed how the Galena and Wilamette hops produced an aromatic quality to the beer. I figured adding honey to that would add a fresh, clear character on top of that, while adding additional complimentary aromatics. A rich, organic buckwheat honey at a local farmer's market I found seemed ideal. Eric was very cautious to the idea of adding honey, concerned that wild yeasts and commercial additives found in honey could ruin the beer. Eric researched brewing with honey, and found several good sources recommending heating the honey for 2 hours at 170 degrees Fahrenheit to kill off all the wild yeasts. I was concerned that this prolonged heating would drive off too many of the aromatics I was hoping to inject into the beer, and showed Eric the book Randy Mosher's Radical Brewing, which claims heating the honey for 20-30 minutes at 170 degrees Fahrenheit is enough to kill off all the wild yeast. We comprised by heating the pound of buckwheat honey for at one hour at 170 F and added it to the carboy four days after the initial pitching of the yeast, after the initial fermentation had largely died down. Eric also suggested we go little different direction than an light amber ale. I was planning to use only a pound of crystal malt in the brew, but Eric wanted a more layered malt character to the beer, suggesting we add 6 ounces of biscuit and carapils malts, and a single ounce of chocolate malt in addition to the crystal malt into the recipe. Biscuit malt sounded pretty good to me, and biscuits and honey is a great combination, so I suggested we go for a pound of it in our five gallon batch rather than the 6 ounces he originally suggested, which he enthusiastically agreed to. The final recipe was not what either of us had in mind at the start, and was largely a product of a compromises. And since a bunch of compromises often satisfies no one, we could have easily ended up creating a muddled, directionless tasting beer. But we think we've knocked this one out of the park! It's still bottle conditioning so we haven't tasted the final result, but sampling the beer as it went in bottles, the layering of malt components gives it a nice malty complexity and we can taste the buckwheat honey giving it a nice background note. There's a smooth, yet strong hop bitterness that is perhaps too assertive, but it should continue to mellow a bit over time. The ale has a lively, complex yet drinkable character that should carry through after the bottle conditioning is complete. But the quality of the beer is really secondary. From our collaboration, Eric found a way to return to homebrewing, and gave me a top flight homebrew education in the process. Two friends who kept telling each other they should see each other more often finally did that. Once Eric and I racked and bottled our share of our efforts, we split a bottle of Sierra Nevada and Anchor Brewing collaborative Imperial Stout . I couldn't help wondering what happened as this beer was created. It's hard to image Ken Grossman and Fritz Maytag arguing in front of the brew kettle, but it's a little hard to believe two passionate, independent, and strong willed individuals didn't have a few differences to work out when they brewed this. It's a great, creamy complex Imperial Stout with a strong bitter chocolate character with a little smokey and nutty undertones. Was this a result of Grossman's and Maytag's combined brewing vision, or simply a product of compromises? At that point, Eric and I really didn't care about that. We just enjoyed their final result.